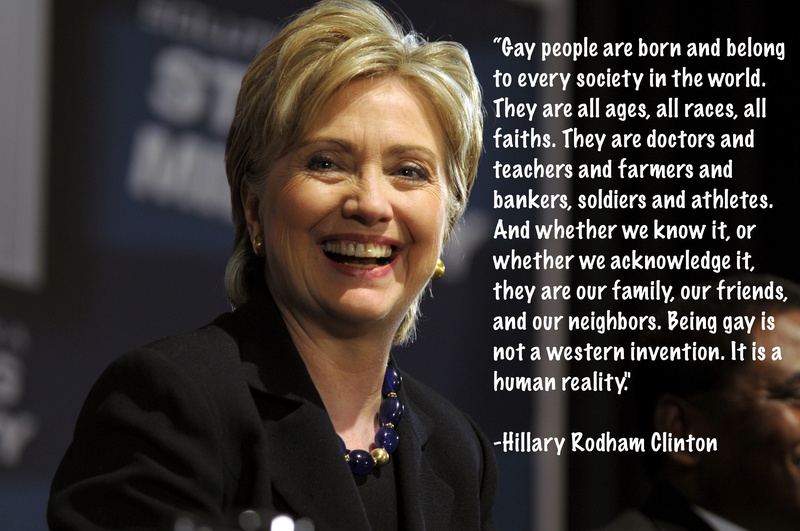 Hillary Clinton on LGBT equality. Hillary Rodham Clinton is perhaps the most profound example of a woman using her political weight to change the world for the better. She has spent the majority of her life climbing the political ladder in Washington, and some believe that she will become the first female American President, a symbolic embodiment of a more equal world. Clinton has shown remarkable strength and poise throughout her career in the public spotlight. She has faced all of the normal stereotypes and accusations about women in positions of power – the frigidity, the weakness, and worse – with dignity that is telling of a woman of very strong character and convictions. She is autonomous, cuttingly intelligent, and forward thinking in her vision for a more equal world that women in particular will help cultivate, if given the chance. 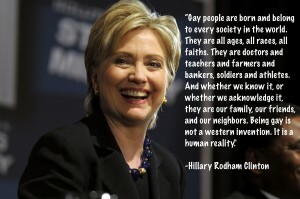 Clinton herself is a leader to a more equal world. Read her full profile here.